Cozy up with this winter greenery wedding shoot from Sara Elizabeth Photography! A woodsy Maine landscape set the scene for this clean and elegant holiday inspiration, with lush seasonal florals from Fairwinds Florist of Blue Hill! 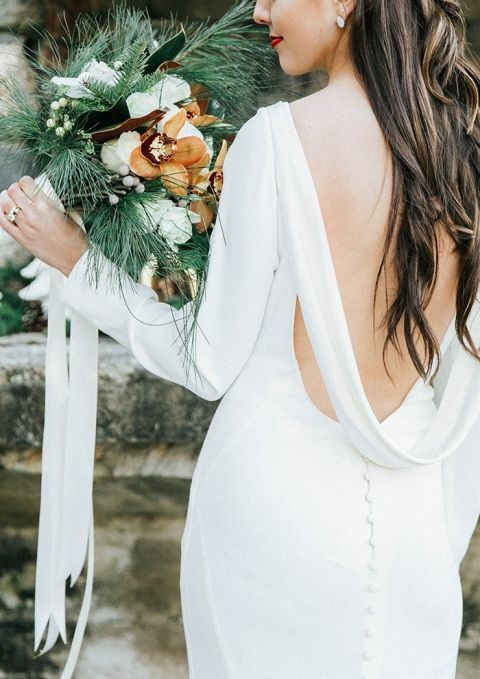 The bride’s gorgeous Martina Liana wedding dress with long sleeves added a crisp touch to the riot of winter greenery that gave the shoot its signature look. 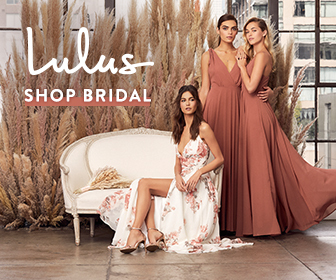 A bouquet of fir branches, magnolia leaves, and golden orchids stood out against the clean lines of the elegant crepe dress, while the deep back showed off her romantic partial updo. 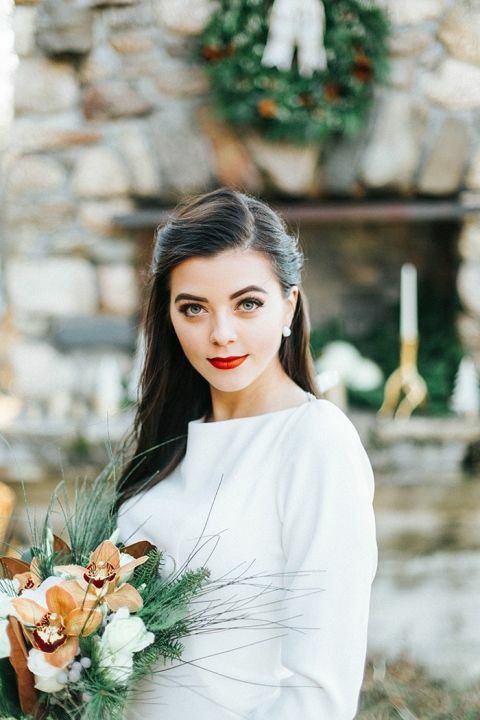 Holiday red lips and a stunner of an engagement ring completed the perfect winter bridal look. 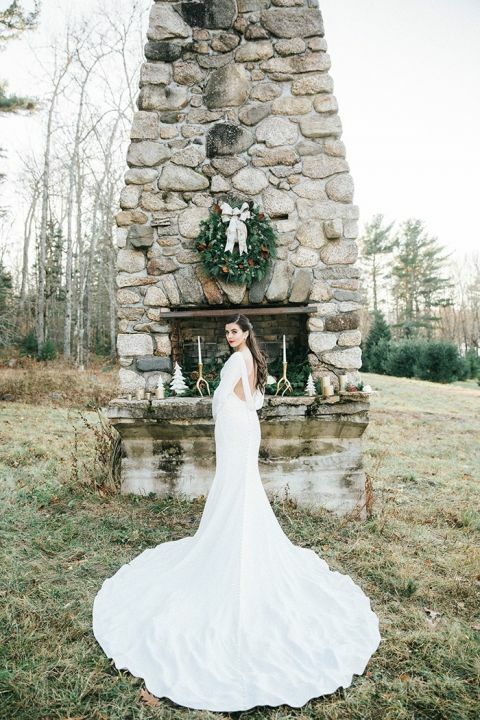 A stone chimney became the focal point for the shoot, set with foraged branches and gold holiday decor. A single layer semi-naked cake with cranberries added the perfect rustic touch to the elegant mantel. A farm table and benches from local woodworkers Jon D Woodward & Sons created a welcome reception space by the stone fireplace. A long pine runner with black and white anemones ran the length of the table. Gold dipped antler candle holders gave the decor a pop of gold while keeping with the woodland vibe! 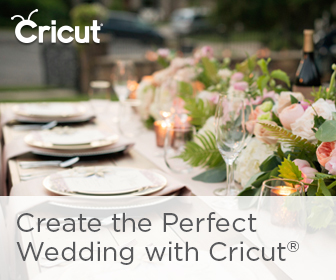 Wood stump slices adorned each plate, with magnolia leaves and fir sprigs to add a rustic winter touch, while china cups of hot chocolate and marshmallows awaited guests at each place setting!